Well my significant other and I just found out today about the new ipod shuffle. We were pretty amazed as usual with this new addition to the family. We started buying ipods on the second generation of the original ipod. A long time ago, In a galaxy far, far away. Oops wandered a bit there... Anyway We didn't buy a new ipod every time one came out, (only when there was big improvements) but we've now owned the Original, the Classic, the Touch and 2 of the clip on Shuffles. One in silver (my husbands) and mine a metallic electric blue. Well my husband did it again! He's a genius. I walked upstairs 3 days ago to Dan telling me I had an email I needed to look at. He was doing some updates on my laptop, so I said I've quick look, and to my great surprise it was from him. In this email was a link to my own recipe web site. ruthsfood.com One he had put together using Drupal in 2 afternoons. I still can't hardly believe we are finally out with the old and in with the new! I have believed from the beginning of Obama's campaign that he was a good candidate for president. As a Gen Xer I breath a sigh of relief to have a younger president who believes in world piece. Someone willing to change the old ways to make this a better world for us all. A friend of mine from Northern Ireland wrote this in a email to me today. I just wanted to let everyone know that I have a new product in time for the holidays. 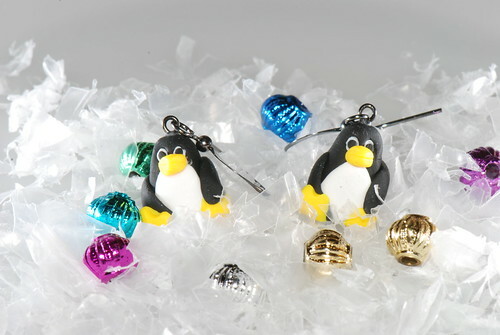 They are Tux penguin mascot earrings. They are made from Polymer clay and are 3/4" tall. They dangle from gun metal shepherds hooks. This is one of my all time favorite recipes. I made them tonight and just got to thinking that more people should eat these. The recipe comes from "The Complete Book of Greek Cooking". 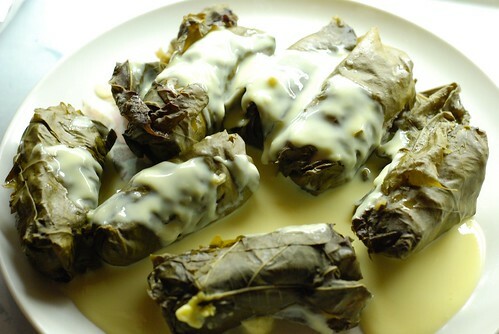 The grape leaves cook for 3 hours in a 350 degree oven so it can be made up the night before even. Hello everyone! It's been a very busy couple of months. Sophia is 4 months old now and getting so big. She is 15 lbs. 13 ounces and 26 3/4". With her dad being 6'4" she doesn't stand a chance. Gates of the Mountains Boat Tour in MT. We recently took a Sunday and went for a drive. We needed some time away from home and to get away with our new little addition. So off we went and headed towards Helena MT. We decided to do some rock hounding and see were we ended up. Well after a successful time collecting some rock specimens we headed up to the Gates of the Mountains boat tour. Boy it was fun. We were expecting some cheesy tour guide and a quick run up the valley. Wow it's been a while since I've blogged and my apologies. Things have changed a bit around here. Back in June of 07 we started trying to get pregnant and low and behold 3 months later we were. It was pretty sweet that we found out on the night of our 8th Wedding Anniversary that our life was about to change drastically. The first 3 months were a challenge, but in the second trimester things got better. I had a very good pregnancy except for having sciatic nerve pain. That was not a lot of fun and I had it the entire 9 months, but it seems to have gone away after having the baby. On April 15, 2008 Discovery Channel Canada put the Geek Girl Jewelry Line on their Daily Planet Show. I was very excited about this and wanted to say hi and welcome to the viewers who saw my jewelry on the show yesterday. I hope you enjoy the site! At our ranch we live 7 miles from a Hutterite Colony. Over the last few years I've been buying all my produce, chickens and eggs from them. In the process I've become very good friends with them all. They are such kind hearted and generous people and wonderful cooks!